Remember the blue guy in the middle? Well, it seems he needed friends so I made him some. Besides being his bot friends, they had other purposes too. One of my daughters has been struggling a little bit. She is trying to figure out what is special about her. She's caught in that trap that so many of us get into where we compare ourselves to others and then we start to feel crappy or worthless. I do it now as an adult but I did it a lot as a kid too. I specifically remember one day telling my dad I was pretty sure I was adopted. In truth, I think I was just trying to get pity so I didn't have to do the dishes but my argument was based on comparing myself to my siblings. Physically we didn't look much a like when I was little and they ALL had talents and I didn't. I struggled with that thought for a long time. I was never as good as them. As an adult I can see how silly I was. Just because my sister was a good dancer or my brother was great at art and had those talents, it didn't diminish my worth. I just thought it did. My little one is in the same boat right now. She sees her sisters and feels less than them. My goal right now, for this summer, is to help her find things she is interested in that she can call her own. We recently had success with a simple little program put on at our library. She really enjoyed it and has since been mentioning the comparisons less .... well, that was until her sister said the program looked fun and now wants to join.... In the end though, it's a continuing process. It's about learning that life isn't about what other people do or talents they have, it's really about what you do and develop for yourself. After a few heart-to-heart talks, I'm hoping she will remember that. I'm also trying to be active in pursuing my own interests as I'm hoping she can see by example that learning, growing, and developing talents is a lifelong process. 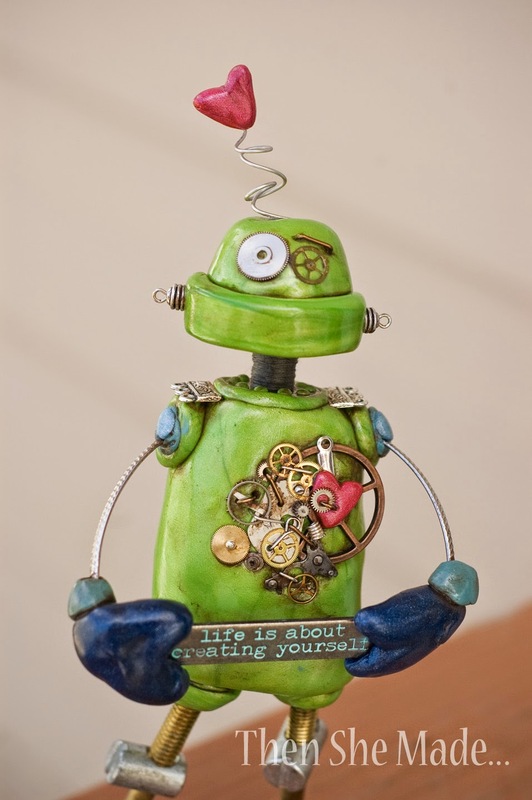 The green bot above will stand as a reminder as well, especially since that is the message he is holding in his hands. 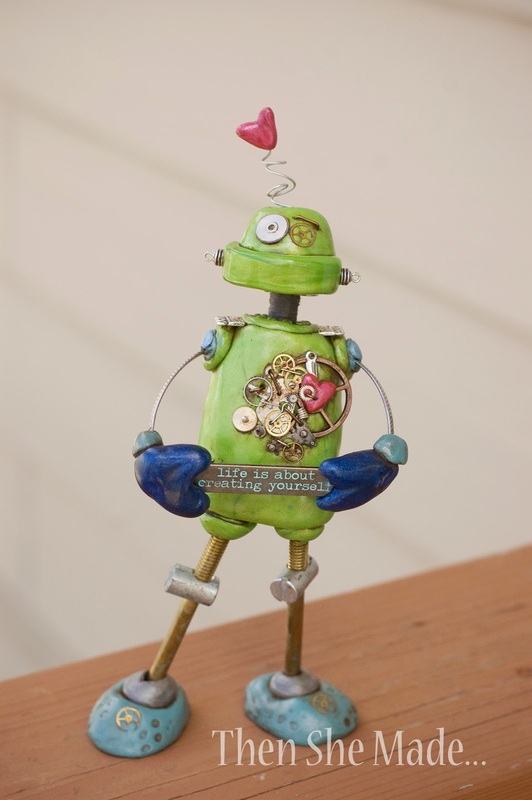 This guy - well, he was made for Mr. K. as a Father's Day present. Yes, normal people give things like bbq equipment and manly things, I give robots. Truth is, Mr. K is an archer. He likes to shoot his bow. Now, before you say that having a bow is manly, he owns a recurve and shoots for precision. He doesn't hunt. 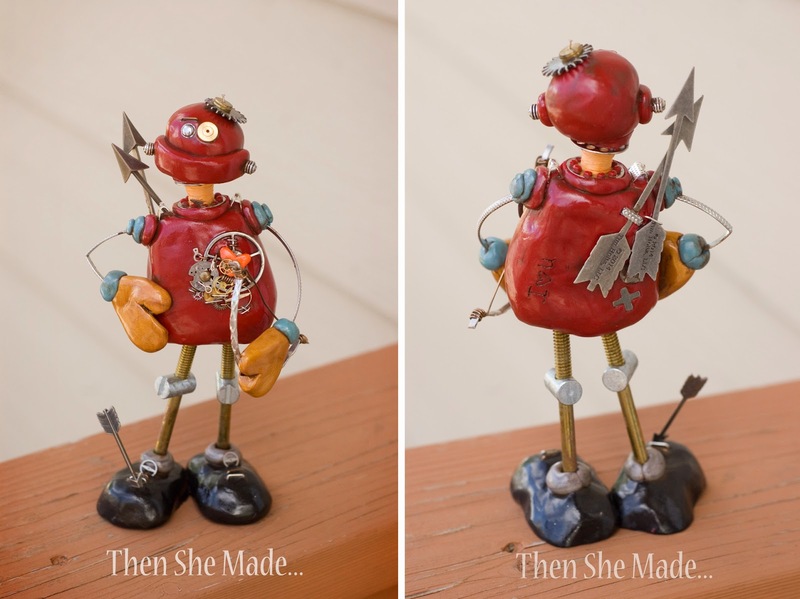 This Archery bot is for his desk at work. Some fun things about the Archery bot is that he is holding a bow, it's a little hard to see in the photos but it's there. He has an arrow sticking out of his foot - Mr K says it's almost impossible to shoot an arrow in your own foot. And, besides my traditional XO on the back side of the bot, this one has a message for Mr. K - I love you! Awwwww. 1- how do help your kids avoid the comparison trap? And 2- What are you giving your dad/husband for Father's day? I'd love to know. Awesome Bots! Intrigued by them and your message to your daughter! Keep the faith! I struggle with the same challenge for my 11yr old. We have spent many hours pursuing classes,camps,workshops & lessons for lots of activities/sports; we've had lots of discussions on what she enjoys & why. She has found that golf fits her spirit of a little competition but with lots of visiting & being a friend. We also do a lot of volunteering in our community. It has shown her how blessed we are and how easy, fun & rewarding it is to share God & her talents. Putting her with people she doesn't know lets her explore & explain herself on her terms, not in terms of her girlfriends (she's an only child so that's who she compares herself to). And I love the robots! 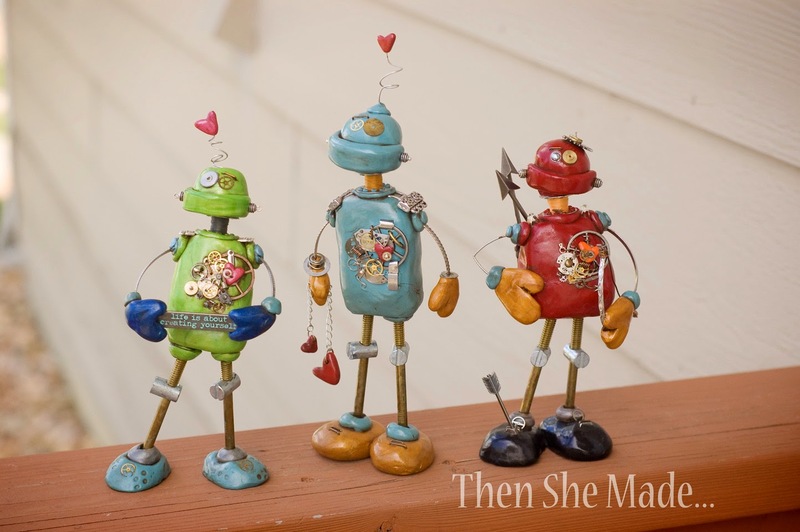 I love the robots and the unconventional gift for your husband! Good food for thought! I'm 55 but I can still remember how hard those discovering years were! The advice in this blog holds true for all ages. P.S. I wear the baseball necklace you made for my friends and me for every game. Every time someone asks who made the necklace and I direct them to your ETSY site I hope you reopen soon because I would love for you to try and make a football! OMG wow wow wow!!! AMAZING project! I want to try make some of my own! Thank you for the inspiration!! !